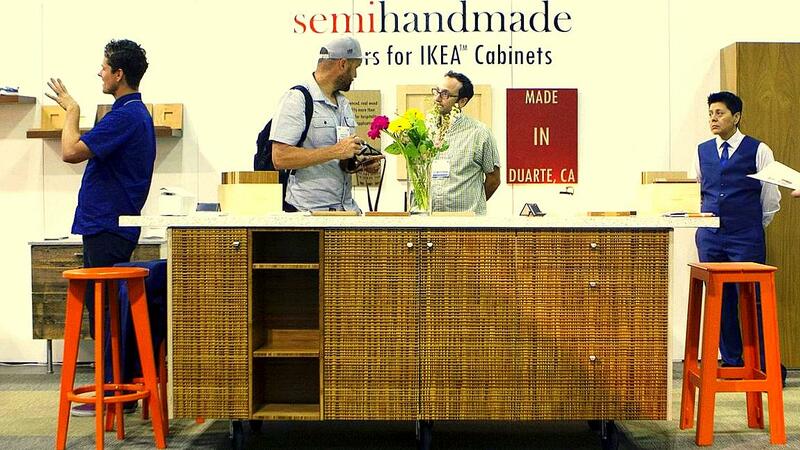 Here’s a nice video re-cap of our Semihandmade IKEA Doors from this past June’s Dwell on Design show in Los Angeles. This was our sixth year at the nation’s largest design event, and we couldn’t be happier with the results. Above is shot of our Plyboo Linear Line for IKEA cabinets that debuted at DOD. Already featured in the LA Times, these one-of-a-kind doors were a huge hit and we are excited to launch them formally this Fall. For more information on Smith and Fong’s amazing bamboo products, and for more Plyboo options to choose from for your IKEA project – kitchen, bathroom, closet or media cabinet – please click here. For steady updates and photos, follow us on Instagram, Facebook, and Twitter. This entry was posted in Dwell on Design, IKEA cabinets doors, IKEA Ecosystem, Press, Semihandmade IKEA Doors, Semihandmade Videos and tagged Dwell Magazine, Dwell On Design, IKEA, IKEA Godmorgon, Semihandmade, Semihandmade doors, Semihandmade IKEA Kitchen by Semihandmade. Bookmark the permalink.